One of my overriding childhood food memories is the annual family barbecue to celebrate my mum's birthday on August 3rd. You could guarantee a pound to a penny that it would rain and my mum would end up barbecuing in the rain while the rest of us sat inside and watched her. An Ingram family barbecue always consists of the same things. To this day. Sausages and burgers must come from the local butcher. The only other thing we're ever allowed is chicken. The salad contains cucumber, lettuce, tomatoes, spring onions and eggs. Nothing else. And most definitely no dressing. Mayonnaise not salad cream. My grandmother's homemade coleslaw and my mother's rice salad. And that's it. Them's the rules. It's like Christmas day. We have rules. God forbid you consider breaking them and trying something new. And my family always say I'm the unadventurous, fussy one! In fact, when I hosted Christmas at my house last year, I was so terrified of doing something different from the norm that I very nearly didn't post anything that day. In a moment of rebellion, I then plumped for Brussel Sprouts with Pancetta but also made regular sprouts for everyone else lest I got in trouble. I was the only one who ate the 'weird' sprouts. And very nice they were too. There are a few green bits in there. Somewhere. Mum's birthday barbecue is fast approaching and I'm desperate to get my family to try the Wahaca Three Tomato Salad, an amazing looking Courgette and Goats Cheese Bread by the lovely Fiona Harvey who I met on my recent soujourn to Scotland. And I want them to try today's rice salad recipe. But I know I'll wimp out and just end up making the birthday cake which I've always been allowed free reign with since I was about eight. My mum's rice salad contains damp long grain rice, frozen prawns which always seem to have retained a bit too much water, peas, carrots and diced red pepper. Colourful maybe, but despite the addition of a little vinaigrette, it's so bland. Whereas the Wahaca salad is brightly coloured and packed with a different taste sensation in every mouthful. 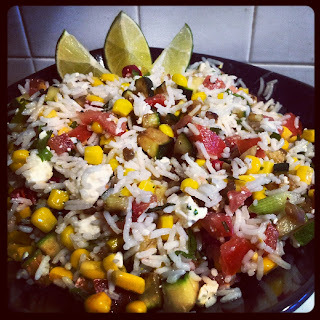 Salty feta, sweet courgettes and corn, spicy chilli and the subtle seasoning of coriander and mint. I had this for my lunch today and it was really quick to prepare and very filling. It would go perfectly with barbecued meat but I'm not sure I'm man enough to make it for the big day. Miers mentions that the original recipe contained leftovers from her green rice recipe but that she now just makes it with plain basmati rice for speed. I definitely want to make the green version at a later date but the idea of putting green rice in front of my family is definitely a step too far. If you want to try this recipe yourself, you can find it in Wahaca: Mexican Food at Home.